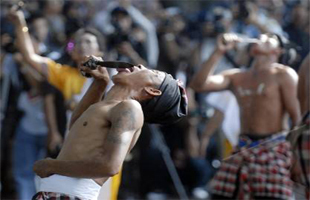 Bali Art Festival or usually called Pesta Kesenian Bali (PKB) is finally held again. In 2013, this annual event has reached the 35th edition with theme “Taksu”. Taksu can be interpreted as evoking creativity and identity for Balinese arts. This event had been opened at the last Saturday, 15th of June 2013 which coincided with students’ school holiday. Just like usual, the opening ceremony was held with a fascinating art parade which was directly inaugurated by the president of Republic of Indonesia, Susilo Bambang Yudhoyono and you can read about Bali Art Festival history here. 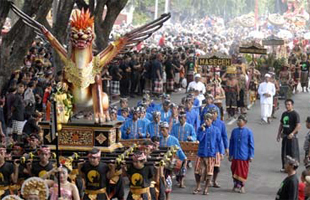 In the opening parade of the 35th Bali Art Festival, every regency in Bali showed their unique and signature arts. Besides that, the opening parade was also enlivened by the appearance of participants from outside Bali like Papua and West Lampung, also from outside Indonesia such as Timor Leste. As usual, Bali Art Festival runs in one month or four weeks started from Saturday 15th of June 2013 and ended at Saturday 13th of July 2013. The place for running various art performances and exhibitions is in the area of Bali Art Centre, Denpasar. Here is the complete schedule for the 35th annual Bali Art Festival.